Albuquerque Beer Scene: Will Boulder Get its Mojo Back? Funny how our tastes change over time. For instance, I used to think that Campbell's Chicken and Dumplings soup paired with a glass of Hi-C Ecto Cooler was just about the best meal you could have. And though those two products are now gone from production, I don't think that pairing would be something I'd take half a day preparing again (non- microwave instructions, of course) if they were available to me. I also used to regularly purchase Boulder Brewing's Mojo IPA, especially when Sunflower Market had six-packs for $5.99. But that IPA seems to have been passed by other IPAs over time, or my tastes have changes to Campbell's IPA with white and wild rice. There's nothing bad about Mojo, just not what I'm looking for IPA-wise these days. Boulder's Planet Porter and Singletrack Copper Ale are still around, but nothing about either of those, especially the packaging, has me interested in buying them. That packaging, depicting the quintessential Colorado outdoorsy activities like putting up a tent after mountain biking uphill for fifty miles have me wishing for a rental car and a suite at the Hyatt every time I see them. Climate control and room service are my friends. 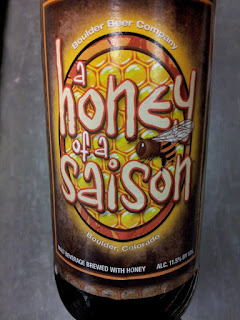 Boulder's newest release, Honey of a Saison, has me intrigued, if for the ABV alone. And also because there aren't any mountains on the label. The beer is 11.5% ABV, so how do we label this one? It does use a Saison yeast. Imperial Saison? Fine, let's go with that. Dupont would roll over in his Delaware grave, but whatever. 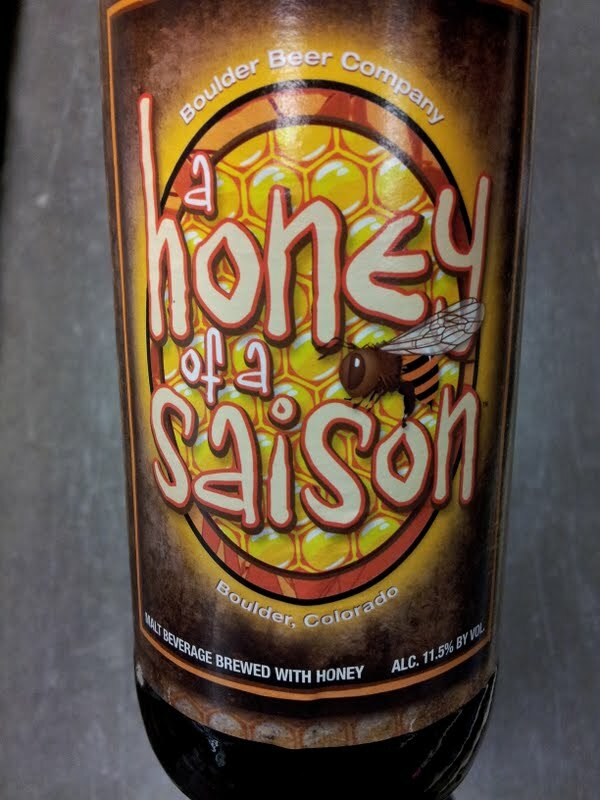 Honey of a Saison also uses Colorado wildflower honey in this beer (not to be confused with the New Mexico wildflower honey Marble uses in their Wildflower Wheat). This is certainly the highest ABV of Boulder's releases that I can recall, perhaps a nod to the trend of more extreme styles. And here's to a trend of beer labels with pictures of hotel rooms.